The softly spoken sister bar to rollicking neighbour Belle’s Hot Chicken, Bar Clarine isn’t one to shout about her assets. And yet she has them in spades. 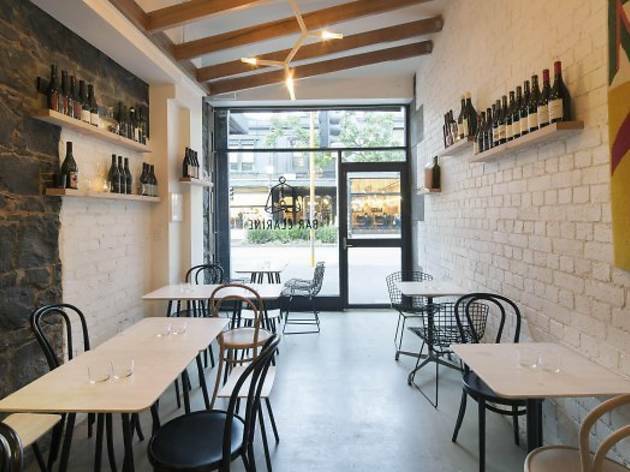 Morgon McGlone, Reno Pontonio and Miranda Campbell’s petite, Scandi-chic wine bar builds on Belle’s passion for natural, biodynamic and minimal-intervention wines. The crew has curated one of the most interesting line-ups in town, spanning crisp Spanish cava, grower Champagnes, examples from experimental McLaren Vale label Brash Higgins, and some edgy skin-contact drops. While some ‘orange’ wines can be polarising, these guys have gone to the effort of sourcing bottles that are not only interesting, but also easy to drink – though they’ll steer you towards the funkier, more challenging options if that’s your schtick. If there’s a downside it’s that only a handful are available by the glass – and the top of the bottles comes in at an eye-popping price, like $425 for the David Leclapart L’Artiste Premier Cru Blanc de Blanc. Can’t drop that kind of coin? No, neither can we. Instead, zero in on a glass of the crisp and clean Bibi Graetz Casamatta Bianco from Tuscany, or the blushing Chevre Pinot Gris out of Mornington Peninsula – a rich, textural treat. The intriguing, offbeat drinks list isn’t the only reason we’ve dubbed Clarine Wine Bar of the Year. We also marvel at the quality of the food coming out of the kitchen, which is smaller than most of us would have at home. 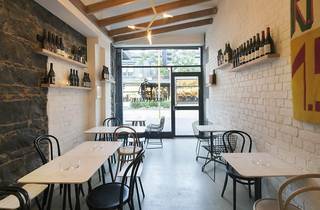 From this tiny tiled alcove, McGlone and Steve Austin produce a daily carte of eight dishes. Sample most of them courtesy of the wallet-friendly tasting menus, and cross your fingers that the cod brandade is on. Flakes of salted cod are mixed through warm mashed potato, crowned with a just-underdone poached egg and sprinkled with briny oyster salt. But the real kicker is the crunchy, salt-flecked wafers of fried fish skin that are served alongside to scoop up the smooth brandade; surely one of the best – and most sustainably minded – chips going around.